Periodontitis, or gum disease, is caused by the bacteria found in dental plaque. Gingivitis is the least severe form of gum disease, followed by periodontitis and advanced periodontitis. If dental plaque is left on the teeth, it becomes tartar, which can only be removed by a dental professional. The build-up of tartar causes inflamed gums, leading to an infection that can damage the tissue and bone structures in your mouth: periodontal disease. If you’re looking for periodontal treatment in Chicago, you’ve come to the right place. At Printers Row Dental Studio, we are devoted to diagnosing and treating your periodontal disease. It is our priority to ensure that you receive the kind and personalized care you deserve. Heredity: Some people are predisposed to periodontal disease. Hormones: Sometimes hormonal changes and pregnancy can make you more susceptible to periodontitis. Medications: Certain medications can cause a decrease in the production of saliva and can, therefore, contribute to periodontitis. Additionally, some medications can cause an overgrowth of gingiva, or gums, making your gums more susceptible to the deep build-up of plaque and tartar. Tobacco use: Tobacco causes periodontal disease and promotes the growth of harmful bacteria. Diabetes: Diabetes can make you more susceptible to infections, including gum disease. If you have periodontal disease, it will be worse if you have diabetes. Furthermore, it is even harder to control your blood sugar if you have periodontitis. Nutrition: A balanced diet that is sufficient in vitamin C and calcium is vital to your oral health. Calcium supports healthy bones, and vitamin C promotes healthy connective tissue. If your diet is lacking these key components, you may be more susceptible to periodontitis. At Printers Row Dental Studio, we are committed to putting your oral health first. 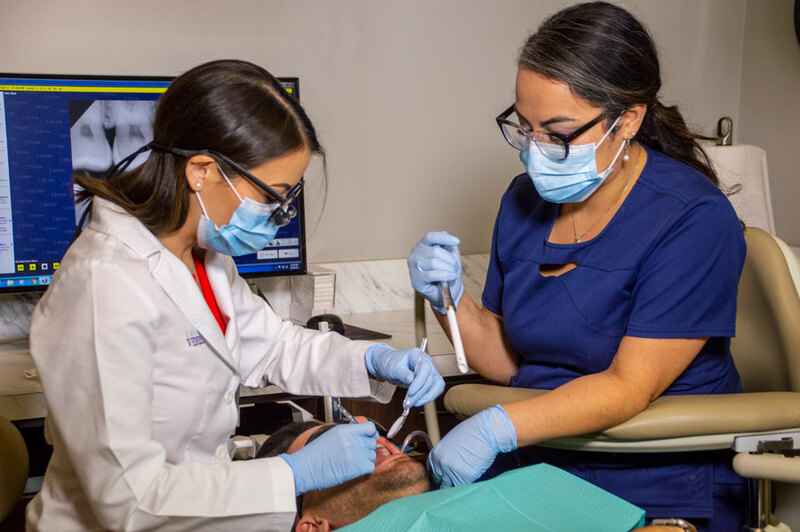 During your initial visit, Dr. Ema will review your medical history and the medications you are taking to ensure that the underlying cause of your periodontitis is considered during the development of your personalized treatment plan. We will examine your gums to determine whether the removal of plaque and tartar will be sufficient to treat your periodontitis. If scaling, the removal of the plaque and tartar, is not sufficient, your dentist may perform a root planing treatment, during which the infected root surface is cleaned. Another possible treatment is a root surface debridement treatment, during which time your dentist will remove the damaged tissue. If you are experiencing any of these symptoms, don’t wait to save your teeth. Call our office today at (312) 435-0411 for your appointment, or request one online.